How to choose between two awful alternatives? The home stretch of this never-ending presidential nominating process is fast upon us. Whether it's "official" now or later, the Democratic nominee is known, barring some miracle of political chicanery. Again barring a miracle, the Republican nominee has been decided for some while. It will almost certainly be Barack Obama vs. John McCain on our ballots in November, and the only third party candidates who seemed to offer the possibility of making a viable bid, Dr. Ron Paul and Michael Bloomberg, have respectfully declined. The time has come for the editors of Scragged to ponder for whom they, personally, will vote, and share that decision with our readers. This is not an easy call to make. Every politician running for anything above the rank of dogcatcher always claims "This is the most important election of your lives!" It's not a lie, exactly - it surely is the most important election of their lives. But considering the state of the economy (generally believed rotten), our reputation in the world (lousy, it would appear), and confidence of the average American in his government and his future (as bad as it's ever been, say the surveys), it's not unreasonable to conclude, as has the mainstream media for months now, that this election truly is momentous. We here at Scragged agree with this analysis, but for totally different reasons. We face a great many threats today, but America has always faced threats and has always prevailed. Nobody likes hard times; nobody wants to fight a war; nobody wants to take a hit to our way of life; but these have all happened before, and America is still here. We survived the Civil War, Spanish flu, WWI, the Great Depression, WWII, the Cold War, and even the disco inferno. Given our track record, we should not be too fatalistic at declaring that America is doomed by this or that. There are really only three things that have the potential to actually destroy America, in the sense of causing our country to cease to be anything that would be recognizable to Americans of the past. Despite appearances, terrorism is not one of those things. For all that the Global War on Terror is critically important, it is simply inconceivable that Osama bin Laden, Mahmoud Ahmadinejad, and the rest will ever reign supreme in a literal sense. What is the worst-case scenario for terrorism? A nuclear attack on an American city, or several. Let us imagine for a moment that day of horror. Suppose the Islamofascists succeed in smuggling, planting, and detonating six nuclear weapons in six cities. Millions would die; millions more would be horribly maimed in a holocaust beyond description. But the vast majority of Americans, and the American system, would survive intact - which is surely more than can be said of whomever was behind the deed. No, a terrorist attack, no matter how horrific, cannot destroy America. On the contrary, as the Japanese Admiral Isoroku Yamamoto discovered when he attacked Pearl Harbor, that sort of thing tends to "...awake a sleeping giant, and fill him with a terrible resolve." As far as we can discern, there are only three things that have the potential to actually destroy America. 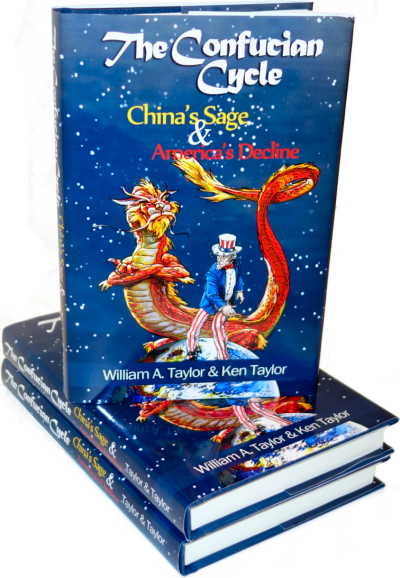 These are: unhindered immigration; collapse of education; and bureaucratic totalitarianism as described in our writings about the Confucian Cycle. What is a nation? For most of human history, a nation has been defined as a group of people sharing one race, one culture, and one religion. Most of the time, you could immediately know what nation a person belonged to by what he wore, what language he spoke, and by what and how he worshiped. A Russian would dress, look, and speak differently than an Englishman, who would dress, look, and speak differently than a Frenchman, and they all would be very different from a Chinese, who would be different yet again from Japanese or Korean - maybe not such that you could tell, but they certainly could. With modern communications, transportation, and globalization, these distinctions have broken down. Everyone in the world, at least the developed world, wears blue jeans, drinks Coke, and speaks English if possible. There are more English-speaking people living in China, for example, than in America. Fortunately, America was not designed around a specific religion or ethnicity; it was the world's first nation based purely on a creed - the love of liberty. Anyone can be an American, no matter what they look like. Being an American is a decision that has to be made in your heart. No matter your origin, you can be a red-blooded American simply by believing you are; but if you don't believe, you are not an American even if you were born here. This hasn't been a problem in the past because, when immigrants came to this land, distance and expense cut them off from their homeland. They had to become Americans or be nothing at all. This isn't true today. For one thing, the vast majority of our modern immigrants (legal and illegal) come from lands that are right next door. With modern technology, they can perfectly well maintain an active connection with their homelands. In many cases, their homelands encourage this. Knowing that the Mexicans in the US are their best and their brightest, for example, the Mexican government does its best to get its citizens in the U.S. to vote in Mexican elections and to send money home. Also, we now have far more immigrants as a percentage of the population than ever before. Whole districts and cities now might as well be in another country. If you grow up in such an environment, even if technically you are in the United States, socially you aren't in America. Many such people choose to become real Americans but many don't. During the height of the Ellis Island era, our public school system's primary function was making foreign children into American citizens so they could work hard and pay taxes to cover the cost of Americanizing them. Their parents might still have an attachment to their native land; but their children would end up as American as anyone else due to daily instruction in its history, culture, and greatness. Today, insofar as public schools teach American history at all, it is generally to emphasize the mistakes and evils that have taken place and to drum in the philosophy that we are no better than anyone else and worse than many. So the children emerge, at best, with a serious ambivalence about patriotism and at worst with as much an attachment to their ethnic group as their parents had. The prevalence of teaching in languages other than English exacerbates the problem, to say nothing of laws which require services to be provided in whatever language the customers happen to speak. If we can't even talk to each other, how can we be "one nation under God?" Our very national motto of E Pluribus Unum declares how dangerous this is - our founders knew that in order for America to succeed, we must all dedicate ourselves to becoming "Out of Many, One." Our public schools are now dedicated to the opposite - Out of One, as Many as Possible. History tells us that when peoples living in the same place become too different, conflict inevitably results. Yugoslavia exploded once the iron grip of Tito was dead and buried; now it is a half-dozen separate countries that hate each other. Czechoslovakia, fortunately, had its two people in generally separate regions and was able to peacefully separate into Slovakia and the Czech Republic when Communism fell. The Palestinians and the Israelis... well, we won't even go there. Even the Belgians are having grave difficulties keeping their government functioning because of conflict between the Dutch-speaking Flemish and the French-speaking Walloons, each with their own history, culture, and grievances. There is absolutely nothing inherently wrong with the people that come here as immigrants. They are no lazier, no more criminally inclined, and no more genetically "deficient" in any other way than anyone else. But because we have turned off the burner under the melting pot, we no longer produce Americans. Instead we have hyphenated Americans; and if the trend continues, eventually the "American" part will be dropped, and God only knows what will happen then. Both of the major candidates have expressed a firm commitment to allowing in pretty much anyone who wants in, which basically applies to anyone in the entire world who can manage to get here, and expect no particular adaptations from them once they arrive. John McCain, through gritted teeth, said he'd try to secure the border; but once his nomination became inevitable, he went right back to his comprehensive plan of "Howdy, Stranger!" Barack Obama has never felt anything but the same way. No matter who is elected, the Balkanization of America will accelerate. The end of patriotic education and production of American citizens in our public schools is bad enough, but that is far from the worst problem there. The violence, disorder, debauchery, and ignorance found in our halls of learning has been detailed beyond the need to repeat here. In comparison with other countries as to quality of primary and secondary education, the United States is invariably in the cellar. Stories of graduates who cannot read their own diplomas are so commonplace as to no longer even be newsworthy. Perhaps the most critical failing of our schools, though, was best explained by Ronald Reagan in another context: "The trouble with our liberal friends is not that they are ignorant, but that they know so much that isn't so." From moral relativism through the global warming scam to the core misconception of "Government knows best", our children are being taught not to question and learn, but to rebel in action while, above all, to not think or analyze. Our universities are famously steeped in the doctrine of Communism in all but name. Oftentimes the thought patterns are so far off the beaten path that it's difficult even to have a sensible, logical conversation about political issues - the students Know What Is So. They have no reasons why; they have no actual arguments; they simply Know What Is Right, and if you disagree, then by definition you are Evil Incarnate. That is why conservative speakers on liberal campuses are regularly shouted down and ejected from lecture halls by mob action. If you can't think, you'll swallow any lie you're told. Thinking is not a skill most people are born with; it is a habit that must be taught. At one time, our schools excelled at this; now, they positively discourage thinking. There are many reasons why the current public school quasi-monopolies are so bitterly opposed to any sort of competition or vouchers, but this is surely one of them. The inability to rationally consider truth has crippled the humanities and corrupted the medical and scientific communities, as we see now with the demagoguery against "Global Warming Deniers." The truth of global warming is not a scientific issue; it is a matter of religious belief, and heretics must be hunted down and burned at the stake. There's a reason why modern science and technology did not develop until the Reformation brought the idea of free intellectual discovery into the world; we now seem to be returning to the days of superstition under the guise of a corrupted science. Our technology, our culture, and our optimistic way of life cannot continue in such an environment. Again, both major candidates are foursquare in support of immediate action to combat the Global Warming ephemera at massive cost to our economy and our freedoms. McCain does not consider the issue of competition in education to be of any great concern; and, while Obama has spoken favorably of voucher experiments in the past, clearly his party backers have had a word with him and he has thoroughly disavowed anything other than the standard line of the teachers' unions over the course of this campaign. There can be no expectation of turning around the growing ignorance and assault on reason that is already so widespread under either of the potential presidents. The Confucian Cycle is one of Scragged's signature issues. Briefly put, this is the observation originally made by Confucius that government bureaucracies, once established, tend to grow regardless of efforts to limit them in size. Eventually government agencies so hamper and overload the economy and society that the country collapses or is conquered. In Confucius' view, the only ways to shrink the size of government are a full-scale revolution or by foreign conquest. Confucius had no thought of representative democracy. He never imagined that citizens could influence government at all. We're sorry to disagree with people who advocate spreading democracy, but our American experience has given no reason to think that democracy makes much of a difference. The size, reach, power, intrusiveness, and expense of our government bureaucracies has grown just as steadily as those of the ancient Chinese. In fact, modern governments at all levels consume vastly more (as a percentage) than even the most oppressive tyrannies of the past; it is only because modern technological progress has come so quickly that we've been able to afford our bureaucracy without choking. With the problems in education noted above, we can confidently expect the technological progress to slow; bureaucratic growth won't. If a serious change is not made, we will continue on the path of disaster predicted by Confucius and followed by societies ever since. In this area, there is at least some minor difference between the two candidates. Barack Obama, of course, has proposed more expansions of government than we can count. John McCain is a bit different in that one of his signature issues has been opposition to government waste and corruption. Insofar as he can veto politically-driven earmarks, this would certainly be helpful. The trouble is that earmarks, expensive though they may be, are but a tiny fraction of the Federal budget; and McCain has given not the slightest indication that he intends to begin the wholesale slashing that is required. Only Dr. Ron Paul's proposals even scratched the surface, and those are now whistling down the wind. In fact, from John McCain's enthusiastic support for "cap-and-trade" regulation of carbon dioxide emissions, supported with equal verve by Obama and the Democrats, we can expect government control of all aspects of our economy that use energy (which is to say, everything) to reach new heights of intrusiveness and cost; his opposition to earmarks will be no more than a maraschino cherry atop a garbage dumpster. There are many conservatives who look at the same evidence we do, share the same deep concerns we have, and on that basis nevertheless choose to support John McCain. They rightly point out that McCain will be "not as bad" as Obama; that the government will grow "not as much," that illegals and other immigrants will be "not as welcomed"; and, at the very least, the mere fact of a Republican President and Democratic Congress will lead to infighting and gridlock as it has before. A Do-Nothing Congress and President, they say, are far better than a Do-Evil one. There are two problems with this view. First, McCain is famous for and indeed boastful of his experience in working with Democrats to accomplish things jointly, and he is in complete agreement with the Democrats on what we believe to be the critical, and fatal, issues of our time. It's conceivable that conservative Republican congressmen might fight these trends but that seems unlikely. If current polls are any indication, there will be far too few of them to have much effect, and how can a small group fight against both an overwhelming Democrat majority and a President nominally from their own party? Second, given that the question of the direction of the country has been settled and the only remaining issue is how fast the collapse comes, there's an argument to be made that faster is better. Most people nowadays don't even remember a time when they were free to make their own decisions. As far as they have experienced, it is natural and normal to be all but strip-searched at the airport; to have to go on bended knee to the town fathers for permission to put up a shed in their own backyard; for the police to issue tickets for not buckling one's own seatbelt or for polluting one's own lungs with tobacco smoke. Intrusions that one hundred years ago would have caused a revolution are now taken for granted. The familiar example of the frog in hot water is applicable here. The great curmudgeon H.L. Mencken once defined democracy as "the theory that the common people know what they want, and deserve to get it good and hard." It looks like people want energy and fuel to be unaffordable thanks to global warming taxes and regulations; they want the same friendly and efficient service of the DMV and TSA to be extended to their doctor's office; and they want the same failed union-based and monopolistic structure of our public schools to continue indefinitely. They clearly don't want the borders to stay open, but that doesn't appear to make much difference in the voting, alas, so it doesn't count. If, as does Scragged, you believe that all these things are the stuff of nightmares, then we might do better to have a nightmare so sudden, harsh, and horrific as to cause a full and prompt awakening. Thus far, you might think us about to endorse Barack Obama. And don't think we didn't ponder it long and hard. But could we in good conscience actually cast a vote for someone who is sworn to visit all the evils on our land which he espouses? We couldn't bring ourselves to do that. The trouble is, the same is true for John McCain. Yet to abstain would be ridiculous; are we so far gone as a country that truly nothing can be done? If that's the case, then it's time to take up arms and somehow we don't think we're quite there yet either. A look at history shows that third-party candidates affect national politics only insofar as they either a) win or b) take away so much support from one major candidate as to throw the victory to the other. Neither seems likely this time, so that's no solution. However, in surfing the Internet researching the ebb and flow of politics as we do, we have unearthed an alternative. It may seem bizarre and shocking, but we live in bizarre and shocking times. On November 4, 2008, as candidate for President of the United States, we intend to write in the name of Mickey Mouse. The name of Mickey has appeared on many ballots over the years and has never been more than a joke. This time can be different. There are so many people who are so disgusted with the process and the candidates that if all or many of them took the same simple action of writing in Mickey Mouse, the numbers would be amazing. How many people - even national talk-show hosts and conservative writers - have publicly longed for an option of "None Of The Above"? That's exactly what Mickey represents - a big fat middle finger of disgust at the choices presented us. The appealing thing about Mickey is that he stands for nothing in particular. The trouble with third party candidates is that they actually do stand for Something, which may or may not be attractive. Mickey has no policies; he gores nobody's oxen; he proposes to cut nobody's favored programs. He is a symbol, nothing more, and anyone and everyone dissatisfied with the choices on offer for whatever reason can support him. Obviously, he's not going to win. But as President Bush pointed out after winning the 2004 election, by virtue of achieving a majority of votes he had acquired political capital that he intended to use. If a cartoon character can gather 5, 10, 15, dare we imagine 20% of the vote, then whoever the "real" winner is would be gravely handicapped. Yes, Obama or McCain would be sitting in the Oval Office and riding in Air Force One; yes, they'd have their finger on the nuclear button and be making their own appointments to the Cabinet. But they'd be a laughingstock, and find a much harder time accomplishing their Big Ideas - the overwhelming majority of which, as we've seen, are really Bad Ideas. Our friends at MickeyForPresident.com have presented this idea in an appealing and thought-provoking way. Indeed, their views provoked this article. So we encourage all Scragged readers to take a look there; to consider the arguments; and, if agreeable, to join in the cause. Honestly, it's the only choice we could find that had any potential of a good effect that was not so nauseating we could not stomach it. But if we can make a difference this year, perhaps the future will be better for all of us. Hear hear! I suppose it can't be any worse than doing nothing. And that's what I planned to do this time - stay home. "If you can't think, you'll swallow any lie you're told." Therein lies the root of our problems. I disagree, however, with your final assessment. McCain would be a horrible president, but Obama would be an absolute disaster, so bad as to make Carter look like Lincoln in comparison. Save the USA, in 4 years: Vote Obama. Anyone who actually REMEMBERS Carter will understand why. I've gone back and forth on Tony's assertion. Sometimes I agree, sometimes I don't. What I've finally decided is that the press will not LET him be a disaster; nor will the "anything change" idiot youth crowd. They will martyr him and his first-black status forever regardless of what he does in office. twibi, You envision a far more successful Obama presidency than I do! I thought long and hard about what you said - and you're right, the press WILL back him, and make all sorts of excuses, and try to tell us how everything is not HIS fault. But I have listened to Obama, and to his complete lack of understanding of the realities of how the world works, and I have concluded that an Obama presidency will be so much of a disaster that no matter WHAT the press does, people will see it for what it is. And in the process, the MSM will lose much of what little credibility they still have. But, somehow, i don't think it's going to work out that way. McCain is going to be elected, and the Republican party will be made even more marginal as the party continues to be led by the RINO's who are almost as liberal as the Dems. And Hillary will breeze in to "save the day" in 2012. While some points are made, writing in Mickey Mouse is a farce. It says there are no differences in the candidates. This thesis is incorrect. It so happens that there might not be a straight-line conservative running, but there IS a difference. My son is in the Army and slated to go to Iraq in November. Do I want him under a leader like Obama? No. If he is, he becomes a UN mercenary, not a US soldier (see Obama's Global War on Poverty Initiative and his pledge of allegiance to the UN). Go ahead, write in Mickey Mouse. But I expect to hear no Scrag whining about Obama policies. NONE. Ready for change, Scrag baby? No crying allowed. Good points all around. Personally, I don't think McCain has a chance. I'm young, but in my 30 years, I've never seen a more rabid political movement than the groundswell that Obama has behind him. But you might be right. I'm torn really. What about a 3rd party guy like Bob Barr or Chuck Baldwin? I understand your point about there being a difference, but I cannot in good conscience vote for John McCain. He is wildly opposed to 4 major things and 5-8 minor things that I consider important. I unhappily voted for Bush, because he was at least close to my positions. But I don't consider McCain even close. And if voting 3rd party is okay, how is that any different? We both know that the only purpose of a 3rd party vote is to take away from one of the main parties. It is remotely possible for one of the 3rd party guys to win. Writing in Mickey Mouse does NOT say there is no difference between the candidates. It simply says neither are acceptable. To make a ludicrously extreme example, would you vote for Hitler vs Stalin if those were the only two choices? They're quite different. You might even be able to find an individual policy or two they espouse which are not so very bad, if you dig hard enough. But anyone with sense can see that neither is acceptable. McCain and Obama are a very far cry from murderous dictators, but the principle is the same. As a conservative, I can't in good conscience vote for someone who wants to destroy the country through untrammelled illegal immigration. That makes it a matter of, what solution can best express my disgust? This is appealing simply because it is so outlandish. Anyway, I can easily imagine a situation where a McCain presidency would be far worse than an Obama one, because McCain would do almost all the same things Obama would (no, not in Iraq I grant you) and thus Republicans would be given all the blame for them. With a totally Democrat government, there would be no way to shift the blame for the ensuing disaster, as with Carter, and at least we might have a chance later on. And Tony's right. If McCain's elected, expect to have Hillary in 2012. Some of the Scragged usuals here are being lackies for what is really a bad idea. You could, at the very very least, assuming everything else is true, write in a 3rd party candidate or even a real person's name - even your own. To use Mickey Mouse is silly and it cheapens the voting process in my opinion. I have no problem with protest votes, but at least use your own name or a REAL person. "For most of human history, a nation has been defined as a group of people sharing one race, one culture, and one religion." This is not the case. Although this has become the European norm since World War II, still through out much of the world and in Europe before that people ruled over those that weren't like them. For a short listing of cases lets start with Rome, it conquered the entire Mediterranean world that included many different people. Although some of those people were proud to be part of the Roman Empire they were allowed and did remain culturally distinct from the people of Rome proper. The Jews are an exceptional example of this in that they were even allowed to not bow to the same gods as the Romans. During the Viking era the Danelaw extended over large areas of the British Isles despite the native Anglos, Saxons and Celts keeping their very different customs. During the Forth Crusade a group of Franks conquered Byzantium and although the rest of the Latin Kingdom of Byzantium fell Morea remained in Latin hands for a while mostly due to the rulers of Morea not attempting to force the locals to become more Latin. The Normans ruling Britain, the British ruling over the French, Carolingians ruling over the Saxons, and the Japanese ruling over the Koreans. Xenophobic nations quickly decay. The Muslim nations, the Ottomans in particular, did very well precisely because they accepted people, anyone, as they were into their nation. Many Christians welcomed Muslim rule because unlike their Christian counter parts the Ottoman Turks allowed them to practice their religion as they saw fit. The Ottoman fleet that sailed the Mediterranean Sea was made up almost entirely of Greek Christians. The Spanish Empire did very well until it began expelling the Muslims and the Jews, suddenly the diversity that had allow their science to flourish disappeared. When the Irish arrived here they were not welcomed with open arms. They were hated and reviled for stealing our jobs, for their stupidity. They did not give up their Irish culture. That is why we celebrate St Patty's day. America has done well not despite all of the immigrants but because of them. jonyfries, your examples actually prove Scragged's point. The Roman Empire was just that - an empire. It ruled over many nations. The Jews knew perfectly well that they were Jews, not Romans, and vice versa. You don't have to be independent to be a nation. The Kurds have been a nation for a long long time and have never had self-rule until just recently. But they never confused themselves for Arabs, Persians, or Turks. America has done well because of the immigrant people, yes, but because they brought only the best of their traditions and became Americans in mind and heart. We've never had a group of people here that primarily think of themselves as something other than Americans. "Because everyone in the world knows how to spell his name. In order to be counted on a write-in ballot, you have to get the name exactly right. "Why shouldn't I write in somebody else, or vote for a third party minor candidate? "Are you expecting millions of other people to vote for that same person? Didn't think so. If only a handful of people write in a name, or vote for a minor candidate, it just vanishes into the "Other" category and gets totally ignored. If millions of people write in the same name, though, that is a message that the media and political parties cannot ignore." jony, Rome was an EMPIRE not a nation. The individual nations, as you mentioned, were defined as having a single race/culture/religion. And combining "muslism nations" and "Ottoman" demonstrates a deep misunderstanding of history. The Ottoman empire and conventional Muslim nations were deeply divided and continued to be for a long time. Modern day Turkey for instance is vastly different politically speaking than the southern Arabian states. Try telling any of the Muslim nations of today that "they are welcoming of Christians". That's a ridiculous idea considering the Christian persecution that goes on there. The vast majority of "xenophobia" today is found precisely in the Middle East. The problem with liberals is that they make up so much "evil" that the US does, they can't see the real stuff everywhere else.